By Allison Owen There aren't words to describe the feeling at the cutoff of the very first run-through. As I stood out of breath after our first full run of the show earlier this past week I was filled with such a great adrenaline rush. 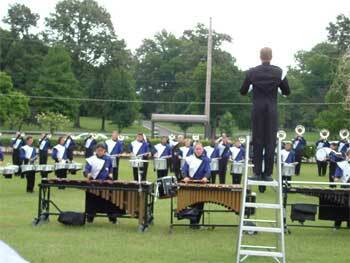 At that point it hit me: I'm marching in a drum corps. It was such an amazing feeling to realize that I am really living my dreams. Don't be cruel: Memphis Sound performs at Graceland. Each person has his own reason for pushing himself to work harder every day. For some it's the thought of a stadium full of thousands of people, for others it's all the people who look up to us and want to march corps because they watch us. No matter what the reason, we can't waste a single moment and we know that in the end it will be worth it. As we finished that first run through I thought about how it would feel in August when we finished the show for the last time. I keep pushing myself for that: When it's all said and done, I want to look back and have no regrets about anything that happened. When things get difficult I just have to keep pushing myself and think about how I want to feel after we finish performing for the last time. Each day we work on making our show better. Yes, it can get very frustrating from time to time when we run the same segments over and over -- and it's the segment when the guard is jazz-running all the way across the field -- or I can't get a certain toss after working on it for a very long time. But that's what drum corps is all about: Learning and perfecting your show. We have to work on being the best we can possibly be, and that means working hard and not wasting any time. There is still a lot to be done, but we've accomplished so much already. We leave on tour in three days. I can't believe that in a week we will have already performed our show a few times in front of thousands of people. I'm a little bit apprehensive, but this is what I've been dreaming of for a very long time, so I can't wait to see what this next week brings. There is nothing like drum corps; it's a sport of its own. So when it gets tough, just think of the adrenaline rush in August after the final performance. It's worth it.